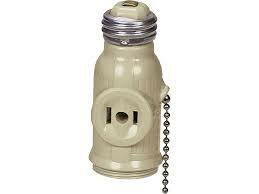 two convenient outlets to your home using a 2-Outlet To Socket Light Plug Adapter from JAMES. Ideal for holiday lights, workshop, garage, or utility room use, you can add more outlets where you need them most and is easy to install. Carefully remove the existing bulb, screw in Outlet To Socket Light Plug adapter and simply replace the bulb. Make sure to turn off light fixture before installation. Please note that this adapter is for indoor use only and is not intended for use in wet locations. This product is UL listed.